A few days ago Milan asked me if I happened to know some cool electronic LP, that Jurriaan Andriessen made in the seventies, called “Hardware software” . He let me hear fragments of the LP and it is indeed a great record. Better than the LP that I have of Jurriaan Andriessen. This one is called “Awakening dream” . I bought it long time ago, but since most of the instrumental compositions are a bit too far on the mellow side for my taste, I rarely play it. Milan also wrote that Jurriaan had written some articles on science fiction for a long gone Dutch magazine ( Gummi ), and asks if it is worth to try and write an article about Jurriaan Andriessen for our Fool’s Gold project. While writing this I am listening to “The awakening dream” and I am surprised! It sounds far better than I remember. But that is not the real reason why I am now writing about this LP. The real reason is that the past few days I have been thinking about stopping with this daily Soundtrack. First of all because half of me is not into it. Half of me wants to write about other things, that I find more important than music. And secondly there are the strange and unwanted reactions I sometimes get. It sometimes makes me feel that this Soundtrack is just a waste of time. But I have no idea what it a better or more useful thing to do. Much musicians in my collection are in similar positions as I am. 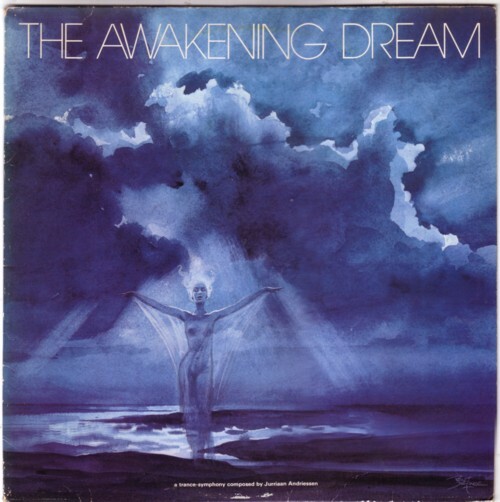 I mean, Jurriaan Andriessen probably did not call his LP “The awakening dream” for no reason. The title suggest that Jurriaan Andriessen is trying to say something with his music. He seemed to be aware to that Life is all about waking up. Many people are. So why don’t we wake up? Why is it so difficult? Or why do I find it so difficult? Meanwhile I have listened to the LP twice and the songs are not as easy listening as I remembered them. Here is for example The Castle of Indolence . Hm, I like this tune. As you, I thought the whole of this record was kind of formless and meandering, but this is excellent. Thanks. Wow Frits, that triggered something…I remember this record well! It was my first discovery of venture in getting into non- mainstream music…I’d completely forgotten about it. I really enjoy your daily showcase and would miss it if it weren’t to continue. you are right! Nice to hear from you. Hi, I am mr Andriessens son, Gijs, and I would like to call your atention to the fact that the Jurriaan Andriessen that wrote the science fiction is not the one that made the records Awakening Dream and HardWare SoftWare. That is my nephew with the same name, the son of my uncle Nico Andriessen, he died very young. Thank you for the info! I think Milan will go after “The Knight” for sure. If there uis also some unreleased material it might be that Basta is interested in releasing a compilation CD of your father’s music. It is definitely worth it.